Agia Galini ( Αγία Γαλήνη ) is one of the most popular seaside resorts on the southern coast of Crete. This small town overlooking the Messara bay is teeming with life during the summer months and provides all necessary tourist facilities. Beaches, emerald sea, caves, the Daedalus and Icarus myths and the old hippie climate make this village now a favorite destination for many tourists. The gentle microclimate that prevails here makes even the sun shine every day in the middle of winter. The location in the central part of Crete, between Rethymno and Heraklion near the famous archaeological sites ( Fajstos , Gortyna, Apoloudou), beautiful beaches (Agios Pavlos, Preveli, Triopetra ), traditional Cretan villages and famous monasteries (Preveli, Odigitria) makes Agia Galini is a good base for organizing even short car and motorcycle trips. The small islets of Paximadia located opposite the village is another place worth visiting. To get here you can buy a cruise on a local boat. By sea you can also reach the beautiful caves west of Agia Galini. In the summer season there are also organized cruises to nearby beaches: Preveli , Agios Pavlos , St. George. Through its amphitheater arrangement of houses and hotels, Agia Galini offers its guests a magnificent view of the harbor and the bay of Mesara, which attracts small ships during the summer. Looking at the city from the port, we have no less impressive view. The hill on which the town is located gives the impression of being sown with white houses and small hotels, while ubiquitous bougainville breaks the white. Strolling the narrow streets in many places you can discover old houses and their amazing architecture. 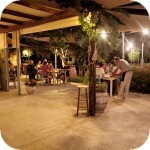 There are plenty of taverns here, where hospitable Greeks offer homemade traditional food. As a tourist destination, it has a fully developed infrastructure, i.e. we can find here supermarkets, ATMs, souvenir shops. The beautiful location and the nearby beach make it one of the most crowded places on the south coast of Crete. Agia Galini has two beaches separated by the river Platis Potamos. The beach west of the river is the main beach with better infrastructure, you will find umbrellas, beach taverns and quite a lot of space here. The eastern beach is not so well organized, however, it is less crowded by tourists. Nearby there are camping sites, which in Crete is rather rare. Agia Galini was built on the site of the Minoan town of Sulia, which was one of the hundred cities described by Homer. In antiquity, Sulia was the port of the Minoan city of Syvritos, but first of all it was known as the place of worship of Artemis. There was a temple dedicated to this goddess. The story of Sulia ends in 640 AD when it was destroyed by pirates. From these times only the remains of buildings, tombs and columns were broken, and the destroyed Soulia was not rebuilt until the Venetian times. The bay over which the current Agia Galini is located was formerly used for mooring ships. It played an important role in the revolutions of 1821 and 1866 when ammunition was unloaded here. Later it was a normal loading port. For a long period of time, olive oil obtained from the fruit of olive trees grown on the surrounding plantations was drifted out of the ship. At that time, there was no inhabited village yet. The regular settlement was founded only in 1884, and for years of systematic commercial traffic its importance increased. In 1890, 20 residents settled there permanently. Until the 1960s, Agia Galini was a small fishing village. This town developed only in the following years. Along with the growing importance of tourism, the number of visitors to the city has also increased. In time, hippies started to come down here as to nearby Matala. Currently, about 800 permanent residents live here, and nearly 3,000 tourists come to the summer season. If you believe the legend, today's name Agia Galini owes the Empress Byzantium Eudocia, the daughter of the Greek philosopher Leoncio. When the Empress was punished for adultery, she went into exile to Africa. The ship she traveled to came across the sea for a huge storm. Eudocia, raising her prayers, ordered the crew to swim to the shore, vowing at the same time that she would build a church in a place where she would be able to find shelter. The Heavens listened to Eudocia, all of them happily docked, while the exiled Empress, in order to fulfill the oath, began building a temple called Panagia Galini. In Greek, γαλήνη means peace, and the name after years was changed to Agia Galini (peace of mind). The remains of this church are still visible at the nearby cemetery. Some sources say that this name refers to the extremely calm sea that is always in this bay. "Remember, son, that you always fly in the middle, between sea and sky"
There is one more story connected with Agia Galini. There is a cave here, in which, according to myths, Dedal escaped from Ikar after escaping from the palace of Minos, for whom he worked as the inventor and builder of the famous labyrinth. The Dedal was so valuable to the king of Crete that he forbade him to return to his homeland. However, Dedal and his son escaped Minos, and then he took refuge in Agia Galini, where he made famous wings with wax and feathers. It was from a nearby hill that they rose on their wings and flew from Crete. We all know how this story ended, and nowadays there are statues of Dedal and Ikar on this hill, who look at the modern city. Behind their backs is a newly built amphitheater, which is dedicated to this legend. This place is easily accessible to visitors. It is worth coming here, not only to look closely at the monuments of the famous mythical heroes, but also to admire the beautiful and picturesque panorama of the city spreading from this point. Agia Galini is located on the south coast of the central part of Crete. It is about 55 km from Rethymnon and about 68 km from Heraklion . If you do not have a car, you can also get here by KTEL bus from both Rethymno and Heraklion. These courses are implemented several times a day throughout the week. For a trip from Rethymno, you have to spend about 1.5 hours, the ticket costs 6.2 €. Coming from Heraklion, remember that the journey will be a little longer (2 hours) and a bit more expensive (8 €). Pozdrawiam serdecznie z Agia Galini - to wlasnie w tej miescowosci jakis czas temu zdecydowalam sie osiedlic, z dala od tlumow, w kameralnym, ale kosmopolitycznym klimacie. Od tego roku prowadze tu niewielki hotel. Idealny dla turystow z ojczyzny, ktorzy nie chca typowego kurortowego all in, ale chcieliby miec polski serwis i po polsku wszelkie turystyczne informacje. Zastanawiam sie, czy jest wiecej Polakow prowadzacych hotele na Krecie - wiecie moze? Bardzo fajna inicjatywa. Myślimy, że znajdzie się sporo osób, które będą chciały skorzystać z oferty. Osobiście nie znamy innych osób z Polski, które zajmują się na Krecie prowadzeniem hoteli. Z pewnością jednak pośród naszych czytelników znajdzie się wielu takich dla których jest to marzenie lub plan na przyszłość :). Pozdrawiamy i życzymy udanego sezonu :). heja, wiecie, jak dostać się z Agia Roumeli do Frangokastello najprościej? Będę w Agia R. i później chciałbym spędzić parę nocy w tym drugim miejscu, ale dopiero tam chcę wypożyczyć auto. Zresztą drogi żadnej nie ma tylko prom z Agia roumeli do Hora Sfakion, ale co dalej? Częso bywamy w Agia Galini. Co to za Hotel ? Z Aghia Roumeli do Chora Sfakion można też dojść pieszo - bardzo ładna trasa, przez plażę Św. Pawła, Marmara, Loutro. Wychodząc rano swobodnie da się dojść na wieczór. Czy jesteś pewien że w Fragokasetllo wypożyczysz samochód? Takiej normalnej wypożyczalni gdzie stoją i czekają samochody na pewno tam nie ma, co najwyżej jakiś pensjonat współpracuje z wypożyczalnią w Plakias czy Chanii i na zamówienie Ci przywiozą - ale czy na pewno to nie wiem. Na pewno szyld "car rental" jest w Chora Sfakion a kilka wypożyczalni - w Plakias - z tym że nie wiem czy z Fragokastello są bezpośrednie autobusy do Plakias, czy trzeba jechać przez Chanię i Rethymnon - przed kilku laty nie było. 1)Czy Agia Galini na 8 nocy to nie za długo ? 3)Czy istnieje możliwość wynajęcia skuterów w Agia Galini? Dodam że przylecimy do Heraklion i stąd też będziemy wracać. Planujecie zwiedzać czy raczej spędzić czas stacjonarnie? Agia Galini jest raczej średnio skomunikowana. W zasadzie autobusy jeżdżą tylko w kierunku Rethymno za to kilka razy dziennie. To raczej spokojna miejscowość położona na uboczu choć dość popularna. My byśmy podzielili jednak te noclegi na dwa miejsca. Plaża też nie powala. Myślimy wstępnie o miejscowości gdzie jest lotnisko na H - wypadla mi nazwa (piatek-poniedzialek) . W poniedziałek przejazd do Agia i do piątku. Heraklion to miasto i to duże. Plus jest taki że możecie z Heraklionu pojechać do Knossos, bo to jest niedaleko. W samym mieście jest kilka ciekawych miejsc. A jaką miejscowość ewentualnie polecacie jako alrernatywe dla Agia ? Zalezy nam żeby byla ładna plaża ale w okolicy tez zeby bylo mozna gdzies sie ruszyc np. Po poludniu bez wlasnego auta,ewentualnie komunikacja miejska. Jeśli chcecie jeździć gdzieś po południu komunikacją to trzeba brać pod uwagę raczej północne wybrzeże i jedną z turystycznych miejscowości w pobliżu Heraklionu. Tylko tam w zasadzie nie ma większego problemu z przemieszczaniem się bo KTEL jeździ bardzo często. Na południu Krety nie ma tak częstych połączeń autobusowych między miejscowościami. Natomiast są fajniejsze plaże np. Matala, Kalamaki, Plakias (nieco dalej za zachód). Matala to turystyczna miejscówka, ale nieco fajniejsza od Agia Galini z lepszą plażą i łatwiej dostępnymi pieszymi szlakami. Kalamaki to dziura ale plażę ma około 2 km. Plakias łączy te cechy ale jest trochę dalej. Jak przylatujesz do Heraklionu i chcesz gdzieś odpocząć, nie koniecznie zwiedzać - polecam Lentas lub Tsotsouras. Tam dojeżdżają ( raz dziennie ) autobusy z Heraklionu. A jak chcesz zwiedzać - to raczej wynajmnij samochód na lotnisku - by swobodnie zwiedzać w oparciu o autobusy należy mieszkać w większym mieście ( np Rethymno) czy popularnym, zatłoczonym kurorcie. skąd pan ma na to pieniądze? Jak chcecie poczuć klimat Krety to po pierwsze nie w lipcu i sierpniu, po drugie szukajcie miejsc których nie ma w ofercie żadne biuro podróży - na zachodzie np Loutro, Soughia, Fragokastelo, Rodakino, w środku Lentas, Kali Limenes Tsotsouras wraz z Maridaki , Kali Limenes i Tris Ekklisies, na wschodzie Xerocampos, Zakros czy Palekastro. Ciekawe miejcsa są też np na płaskowyżu Lassithi. No chyba że chcecie poczuć klimat "imprezowy" - wtedy całkowicie odwrotnie.